This recipe is modified from Martha Stewart’s Cookies. I didn’t need another cookbook, but I am glad that I bought this one. It is well divided and has lovely pictures. I didn’t have quite enough ginger snaps for the crust so for the last few ounces I substituted in graham crackers. I also needed more butter to get the crust to come together and I am not sure if it was due to this change in cookie-type or not. This made a 9 x 13 pan and I was shocked at how quickly they disappeared at my Memorial Day Barbecue. These had a subtle ginger flavor and a nice texture. 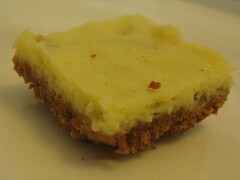 Ginger Cheesecake Bars from Martha Stewart’s Cookies. 1. Preheat oven to 350 F. Coat a 9 x 13 inch rimmed baking pan with cooking spray. 2. Place gingersnaps in a food processor; pulse to a powder. Transfer to a small bowl, and stir in butter until well combined. Press gingersnap mixtures evenly into bottom of prepared baking pan. Bake crust until firm, about 12 minutes. Let cool completely. 3. Meanwhile, put cream cheese in the bowl of an electric mixer fitted with the paddle attachment; beat on medium speed until smooth and softened. Mix in sugar, egg, egg yolk, sour cream, and vanilla until well combined. Mix in candied ginger. 4. Pour the cream cheese mixture onto the crust, and spread evenly with a rubber spatula. Bake, rotating pan halfway through, until filling has puffed and feels slightly firm to the touch (do not let brown), 20 to 25 minutes. Let cool completely on a wire rack. Refrigerate, covered with plastic wrap, until set, about 1 hour. Cut into bars. Bars can be refrigerated in single layers in airtight containers up to 2 days.